No other building material works better for aircraft hangars than steel; no other metal building offers the advantages of RHINO steel aircraft hangars. The incredible strength of steel makes it ideal for hangars. Only steel framing is able to span such long distances without interior load-bearing supports. 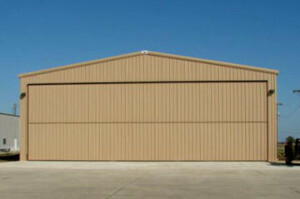 RHINO standard metal hangars can clearspan up to 150’ wide; 200’ or even wider spans are possible with a custom quote. Standard building heights are 40’ but even taller buildings are available with a custom quote. The strength of steel also provides added protection from high winds, fire, heavy snows, lightning, termites, earthquakes, and aging. RHINO’s commercial-grade steel framing is so strong and durable, it is guaranteed to meet or exceed all local building codes for the lifetime of the structure. 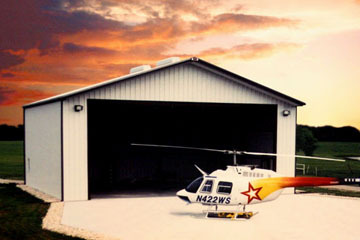 RHINO can design hangars to include mezzanines or overhead cranes. Hangar doors of 45’ or 60’ wide in bifold or overhead doors with electric or hydraulic lifts are available. Sliding aircraft doors are also an option. 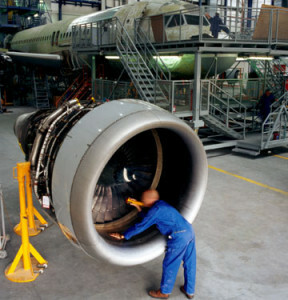 We have buildings and openings to fit any size aircraft from a small single prop to jumbo jet. Hangar doors can also be insulated, if required, and are certified wind rated for your location. We can provide any specialized metal aircraft support buildings needed to accompany your hangar, including corporate offices, multi-purpose facilities, maintenance buildings, shade structures, private jet terminals, and more. RHINO prefab aircraft hangar designs are striking, resilient, and will preserve their beauty and value for decades with virtually no maintenance. Since steel is the most recycled material in the world, building a RHINO steel hangar is also the “green” way to build. Because RHINO’s offers a premium building system at an affordable price and is committed to providing first-class service, over 33% of all our orders this year have been from returning customers or those referred to us by former RHINO building customers. We call this commitment to product and service excellence The RHINO Difference. Check out the The RHINO Difference page for full details. 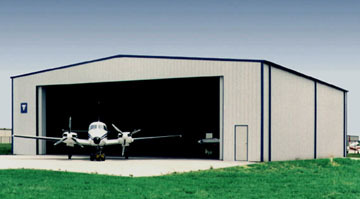 Call our experienced steel framing specialists today to discuss your hangar and aviation building needs at 940.383.9566. Share the post "Steel Aircraft Hangars"